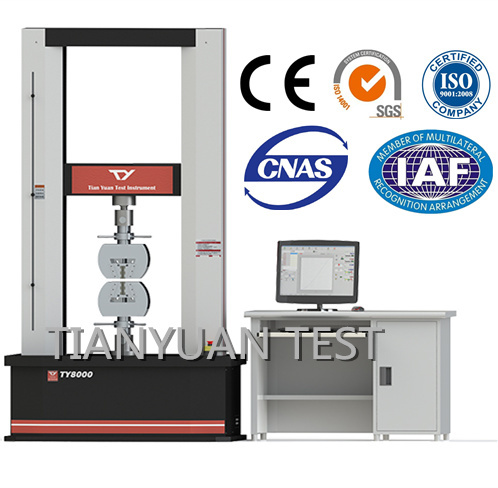 TY8000 series universal testing machines is floor standing with testing capacities as high as 300kN. The typical configuration for this dual column electromechanical UTM for testing the mechanical properties of metals. These flexible systems are widely used for both the development of new alloys and the mechanical properties of metal products. Load VS Displacement Load VS TimeDisplacement VS TimeStress VS. Strain Load VS Two extension can be tested and provide data in accordance with GB, ISO, DIN, ASTM, JIS and other international standards. Looking for ideal Alloy Steel Tensile Strength Test Machine Manufacturer & supplier ? We have a wide selection at great prices to help you get creative. All the Alloy Steel Compression Tester are quality guaranteed. We are China Origin Factory of Universal Testing Machine. If you have any question, please feel free to contact us.